We are excited to welcome you to the DFB Podcast Episode #23! We told you we are working hard to bring you more Podcasts on a more regular basis so we hope you’re as excited as we are! In this episode we will cover some news from this past week as well as get into some exciting #OnTheList business! 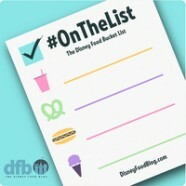 We talk about what #OnTheList — the Disney Food Bucket List — is all about as well as give you a sneak peek at some future items straight off of AJ and Brad’s lists! Great show again and so soon too, fab. Thanks both ? We did a corn taste test during our D23 trip in August and Corn Dog Castle won hands down. Yes, Little Red Wagon is in Disneyland and has super cute theming but it just doesn’t compare to Corn Dog Castle. If you can only have one corn dog, it *needs* to be Corn Dog Castle. We skip the chips/apples so we can savor / focus on / appreciate the corn dog. This is coming from native Texans raised on annual trips to the State Fair for Fletcher’s corn dogs. Don’t waste your corn dog meal on Little Red Wagon. It just doesn’t compare. You are right, I do love the Fried Chicken and the Pomme Frites. My favorite would be the Monte Cristo, My dad though always wants a Cream cheese Pretzel before we leave. My sister has to have a chocolate cake pop.